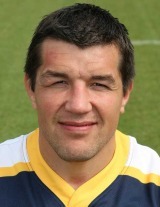 Flanker Fourie moved to the UK from his native South Africa in 2005 to join Rotherham Titans before switching to Yorkshire rivals Leeds Carnegie in 2007. Born in Burgersdorp within South Africa's Eastern Cape, Fourie played for the Shimlas and Maties and the Cheetahs before opting for a move north and he qualified for England on residency grounds in 2009. A strong ball carrier with secure hands and a vigorous tackler, he became a cult figure during his time with Rotherham before attacting equal acclaim at Leeds where his career suffered a cruel blow. He suffered a bicep injury in the first minute of the season's opener against Gloucester and was absent for almost six months. Fully fit again, he showcased his talents in National One and was the club's player of the season with 20 appearances and nine tries as his side regained a place in the Premiership by winning 28 of their 30 games, scoring 1,238 points in the process. His form on Leeds' return to the top flight was rewarded with a call up to the England Saxons squad in February 2010 for their clash with Italy 'A' and he was later drafted in to train with the senior squad for the latter stages of that year's Six Nations. In May 2010 he was included in the England squad to tour Australia. Despite a poor season for Leeds in the Premiership, Fourie played six games for England, making his debut against New Zealand at Twickenham in November 2010. Fourie went on to record his first start against Samoa two matches later and made two further appearances in the 2011 Six Nations. Fourie will move to Sale for the 2011-12 season and was called into Martin Johnson's 45-man training squad for the 2011 World Cup. Fourie missed the cut for the final 30-man squad only to be re-called due to concerns over injury. However he himself succumbed to injury in the second warm-up match against Ireland and was ruled out of the tournament.